Stacy Horn » Blog Archive » Why am I completely ignorant about women composers? Why am I completely ignorant about women composers? 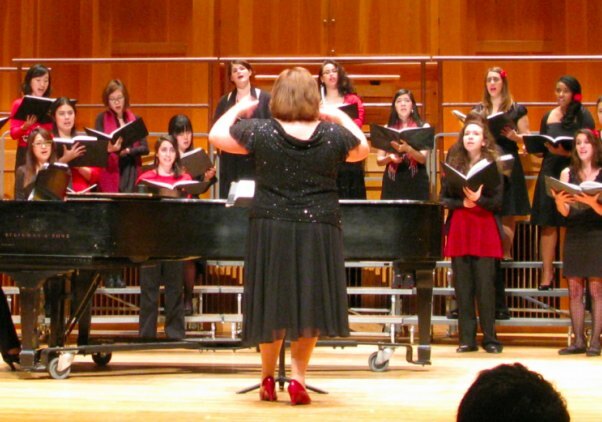 I went out to Queens College and the Aaron Copland School of Music to a concert titled: An Evening of Women in Song. It was wonderful. I’m ashamed to admit I only knew one of the female composers, Britlin Losee, who I wrote about in my book about singing. That is just plain wrong. All these female composers I’ve never heard of! I googled every one of them and some of them are quite famous! My favorite pieces of the night were Britlin’s, which I filmed and uploaded to YouTube, Ysaye M. Barnell’s Sound-bite from Beijing and Bernice Johnson Reagon’s Ella’s Song. Thank you Dr. Sandra Babb and H. Roz Woll (the conductor and assistant conductor) and the Queens College Women’s Choir for such a fabulous night. I’m kicking myself that I didn’t plan this better and bring all my friends. Anyone who wasn’t there really missed out. Because they are women, that’s why. It’s the same reason that Martha Denny Martin Douglas, the wife of Senator Stephen Douglas ended up in an abandoned graveyard just north of me here in North Carolina while Senator Douglas has a city park and a 66 ft tall marble monument in Chicago. Karen that was an AMAZING post!!!! Thank you for pointing me to it. I love stuff like that, as sad as it was.